As we arrived at London Heathrow Airport to meet our first flight to Hong Kong, it was clear that all our clients could not wait to board the plane and begin their 2016 Hong Kong 7s tour. Clients and baggage were all checked in early, allowing Lucy (Gullivers’ senior sales exec) to make her way through security for our first departure whilst I awaited the arrival of more clients departing on a later flight. With both flights being late evening departures, some waited patiently, looking forward to grabbing forty winks on the plane to try and cancel out jet lag on arrival, whilst others were too excited and wasted no time getting in the bar before the flight! With the 12 hour flight behind us, upon arrival we met Yammy, our ground agent from PC Tours. Our ground agents are very specially selected and help us with the location logistics, such as transfers…and also provide those all important bilingual speakers to help us get from A to B. The transfer from the airport to the Excelsior Hotel is roughly 40 minutes, during which Caroline (who has worked on over 20 Hong Kong 7s tours for Gullivers!) 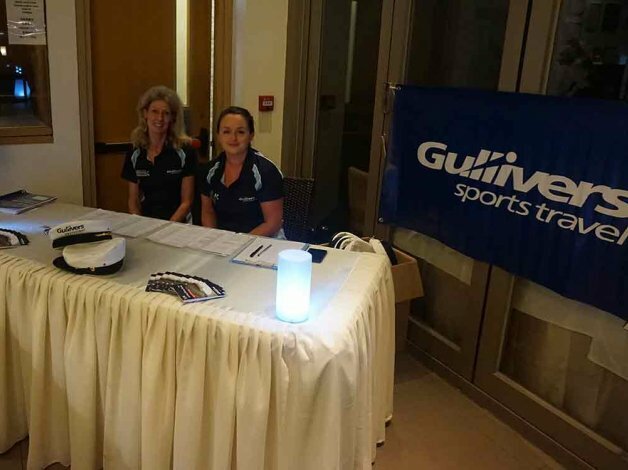 and Lucy were pre-checking in all our guests to allow them to head straight up to their rooms and get comfortable - once they had collected their Gullivers tour shirt and captain’s hats, of course! As it was an evening arrival, most clients opted to head out for a bite to eat and a few drinks before heading off to bed early to recover from a long day of travelling. With our six night tour clients settled in, it was time to enjoy the sights and sounds of Hong Kong before meeting our four night tour clients the next day. The city was still fairly quiet with the rugby a few days away, so a fantastic opportunity to visit places such as Victoria Peak, Stanley Market and Recluse Bay to name a few. If the weather is clear during your stay, take the time to whizz up to Victoria Peak for stunning views across Hong Kong – there really is no better place to snap that memorable Facebook profile picture! Some chose to adopt the full tourist approach and jumped on a tour bus to tick off a number of the sights during the day, whilst others chose to use the cheap public transport available. The well signed, fast and clean MTR (Mass Transit Railway - Hong Kong’s version of the London Underground) seemed to be the most popular method of transport. Combined with taxis, Star Ferry, trams and of course walking, Hong Kong’s popular locations are easily accessible and all for very little cost. Thursday saw the arrival of the majority of our remaining tourists on the four night tour package, with a few arranging their own travel to Hong Kong. With staff located at the airport to meet our clients off their flights, all our arrivals went smoothly and everyone made their way to their hotels on their arranged coach or private transfers. Friday is the start of the rugby sevens, however many guests clearly couldn’t wait for their rugby fix so made their way down to Hong Kong Football Club to see the 10s which took place on Wednesday and Thursday – not a bad warm up before the main event of the week. There was one minor thing to complete before the rugby starts though, our Gullivers Clubhouse! Held at Hooray Bar next to the Excelsior Hotel, our gold and silver package clients were invited to an evening of drinks, canapés and a great Q&A with former England Sevens stars Ollie Phillips and Rob Vickerman – not to mention this all took place at a stunning rooftop bar with views across Hong Kong. The event was a huge success with clients getting the opportunity to chat with Ollie and Rob, grab a picture and get some merchandise signed. Day one of the sevens saw Hong Kong rise early, with a large amount of people heading over to the stadium early to grab their preferred seating. One of the best things about the sevens is that there is no reserved seating, you can sit anywhere in the stadium where there is space, allowing you to mix and mingle with locals as well as supporters from all over the globe. The opening ceremony provided a phenomenal visual spectacle which clearly got everyone in the mood – the party had started and the South Stand were in full swing. With day one of the sevens finishing late evening, many decided this was their time to sample Hong Kong’s nightlife, with people heading straight to Wan Chai and Lang Kwai Fong for their first night out. The next morning, with staff at desk duty (a daily occurrence on tour, just in case anyone has any questions about the day ahead), many guests made their way to breakfast feeling a little worse for wear, and with a few stories of last night’s antics – clearly Hong Kong’s nightlife was to blame! Saturday sees the start of the real rugby, where the competition kicks up a notch and you can begin to see teams making their presence known before the final day of play. However, no one made their presence known more than the South Stand in Hong Kong Stadium. Renowned for its party atmosphere and unique style of fancy dress, the South Stand were in particularly good voice – definitely a sight to behold. Saturday night followed a similar route to Friday, with many clients starting off in the Dickins Bar at the Excelsior Hotel, an English style pub showing plenty of sport. It was great to socialise with our guests in this friendly environment – glad to have such a friendly group, all here to have a fantastic time. Sunday is Finals day! As the sun came up, many clients were still returning from their nights out (you easily lose sense of time in Hong Kong), with others up extremely early to secure their favourite spot in the stadium for finals day. The city was buzzing, with crowds of fans making their way to the stadium to see the concluding rugby action. The day saw a few shock wins, however normal service was resumed in the cup competition with Fiji and New Zealand claiming their spots in the final. Fiji came out fighting, securing the first try and they never looked back. Fiji triumphed 21-7 much to the crowd’s delight and the presentation of the cup and fireworks show which followed were a testament to the sevens - what a sight! Hong Kong partied on well into the early hours of the morning, celebrating what was yet another world class rugby sevens tournament. Hong Kong still holds the crown as the pinnacle of the circuit, setting the standard for rugby sevens all around the world. Monday morning came, and with that, time to depart! With departures throughout the day, staff were stationed at hotels and at the airport to ensure everything ran smoothly. Once all the clients were checked in with British Airways, Virgin Atlantic and Cathay Pacific, it was time to say our goodbyes and prepare for the journey home. The 12 hour return flight provided plenty of time to reflect on what had been a truly memorable sevens tour (as well as ample opportunity to nurse the weekend’s hangovers). Hong Kong, the locals, the excursions, the nightlife and of course the rugby, all combine to provide a unique, exciting, cultural and simply brilliant tour.